Diana, Princess of Wales, was well-loved not only by the Britons but also by millions of people around the world. She injected a breath of fresh air to the Royal Family and her wedding to Prince Charles in 1981 was watched by an unprecedented 750 million! But what endeared her more to the masses is her active campaign against landmines and humanitarian advocacy to help people affected with HIV/AIDS, cancer, and mental illness. 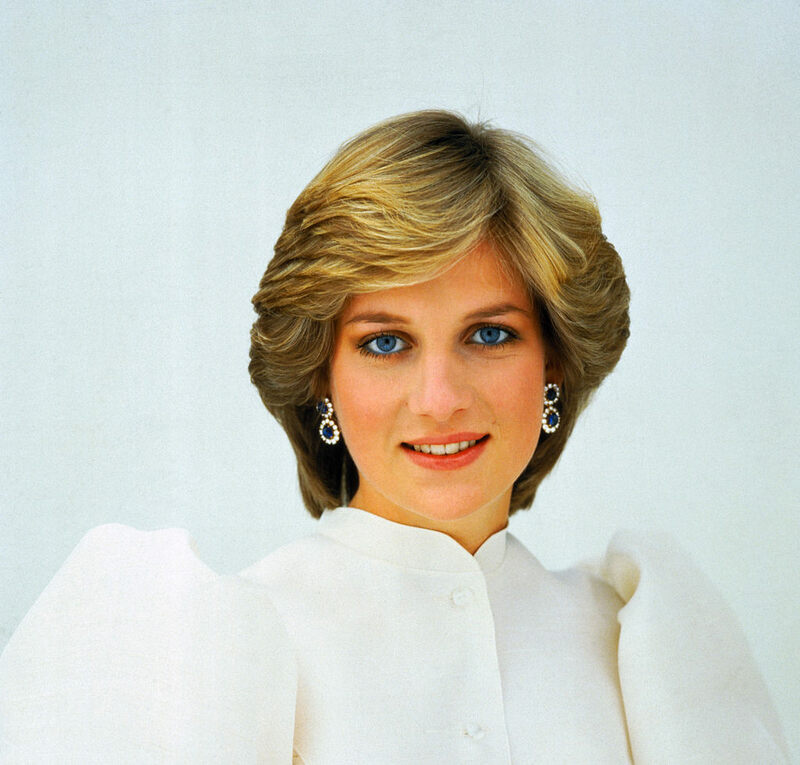 We've scoured books and articles to bring you these 101 facts about the unforgettable "Princess" Diana, Queen of Hearts. 1. Diana Frances Spencer was born in Park House, Sandringham, Norfolk on July 1, 1961. 2. She was the fourth of five children of Edward John Spencer, Viscount Althorp, and Frances Ruth Burke Roche, Viscountess Althorp. 3. She came at a time when her parents badly wanted an heir—a son. The couple’s third child, a boy named John, unfortunately succumbed to death just ten hours after he was born. 4. She was baptized at Sandringham’s St. Mary Magdalene Church. 5. Her family has been closely connected to the British Royal Family for many generations. Her grandmothers were ladies-in-waiting to Queen Elizabeth The Queen Mother. 6. 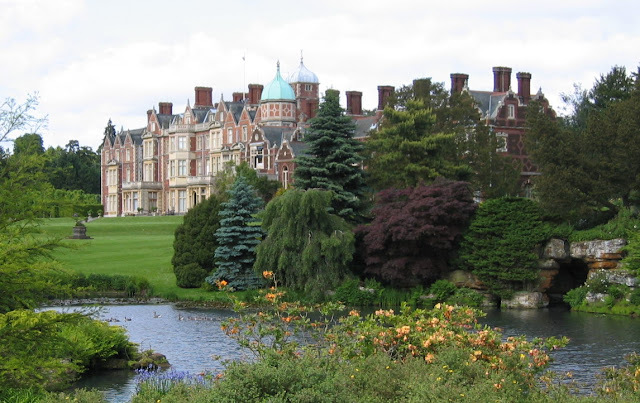 A young Diana would play with Prince Edward and Prince Andrew whenever the Royal family would spend their holidays in their Sandringham property. 7. She and her brother bullied their nannies as they thought they were a threat to their mother. They would go as far as throw the poor ladies’ clothes out of the window. 8. She already knew to ride a horse at the age of three, and she actually had her own pony who she called Souffle. 9. Her parents divorced when she was only six years old, which she regarded as an utterly “painful experience”. 10. She initially lived with her mother until her father won custody of her. This also meant living with her stepmother Raine, Countess of Dartmouth. She detested Raine, who she described as a “bully”. 11. She looked up to her older sister Sarah McCorquodale. She admitted she felt wonderful doing certain tasks for her like packing her suitcase and making her bed. 12. She always felt she was destined for something great. She confessed feeling utterly different and detached from everybody else. 13. Her father taught her and her siblings to send people thank-you letters soon after receiving gifts from them. She would stay late at night making one as she wanted to give it right away. 14. She was home-schooled before starting on her formal education at Gayton, Norfolk’s Silfield Private School. She later transferred to an all-girls school, Riddlesworth Hall School near Thetford. 15. She was a voracious eater that her classmates at Riddlesworth would often tease her about it. They once dared her to finish six pieces of bread and three herring in one sitting, which she successfully did. 16. In 1973, she attended Sevenoaks, Kent’s West Heath Girls’ School. She did not perform well academically, failing twice in her O-levels. Her remarkable community spirit, however, was recognized by the school. At 16, she decided to leave West Heath. 17. She was a skillful pianist, and she excelled in diving and swimming. There even was a dive named after her—the “Spencer Special” wherein she would jump right into the pool and would barely leave any ripple. 18. She also dipped her toes into tap dance and ballet. 19. She became Lady Diana when her father inherited the title Earl of Spencer in 1975. 20. She attended a finishing school in Rougermont, Switzerland, Institut Alpin Vidermanette, in 1978. She stayed there for one term. 21. She once worked as dance instructor, but had to miss work for three months after figuring in a skiing accident. 22. One of her earliest occupations was being a nanny to a London-based American family, the Robertsons. 23. Her mother gifted her with a flat in Earl’s Court on her 18th birthday. 24. Her last documented job before becoming a princess was being a kindergarten assistant at Pimlico’s Young England School. 25. She was 16 when she first met Prince Charles, who that time was dating the older Spencer lass, Lady Sarah. 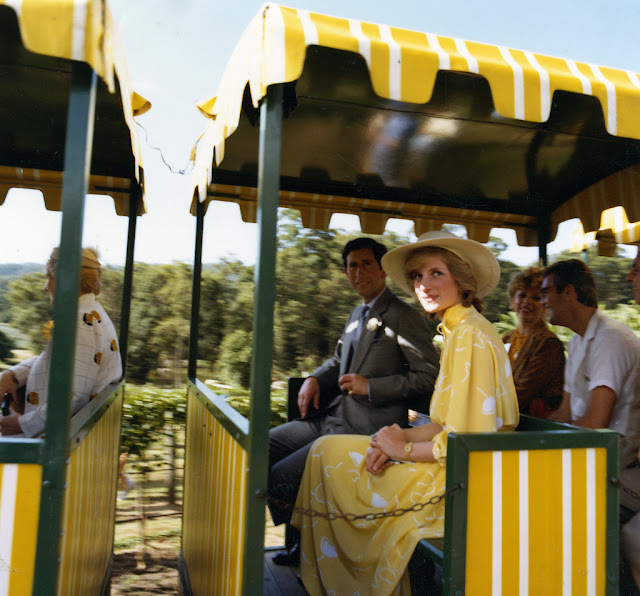 The Prince and Princess of Wales during the Big Pineapple plantation train tour, Woombye, Queensland, 1983. Image: Flickr/Queensland State Archives. 26. Prince Charles first took notice of Diana when the future Princess of Wales watched one of his polo games in 1980. 27. Diana would address Charles as “sir” during the entire courtship period. 28. Prince Charles and Diana only met a few times when he proposed to her on February 6, 1981 at the Buckingham Palace. 29. Diana was only 19 when she got engaged to Prince Charles. 30. The engagement ring? A Garrard-made 12-carat oval blue Ceylon sapphire surrounded by 14 solitaire diamonds, and set in 18-carat white gold. The Prince and Princess of Wales at the aboriginal community, Mutitjulu at Uluru (Ayers Rock), March 1983. Image: Wikimedia/John Hill. 31. 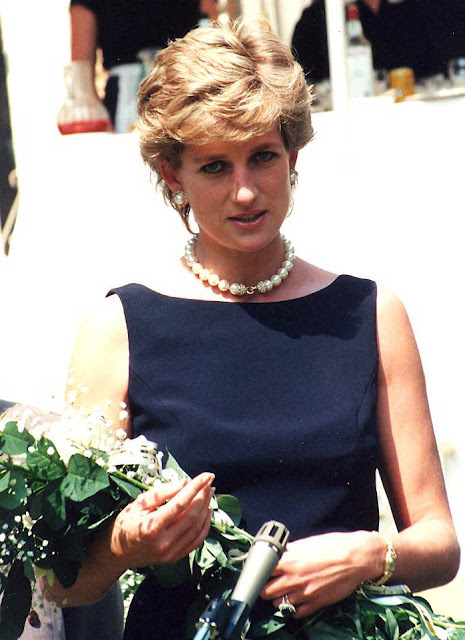 Diana received a sapphire and diamond brooch as an engagement present from The Queen Mother. 32. The engagement was kept a secret until after a few weeks Lady Diana said “yes”. 33. 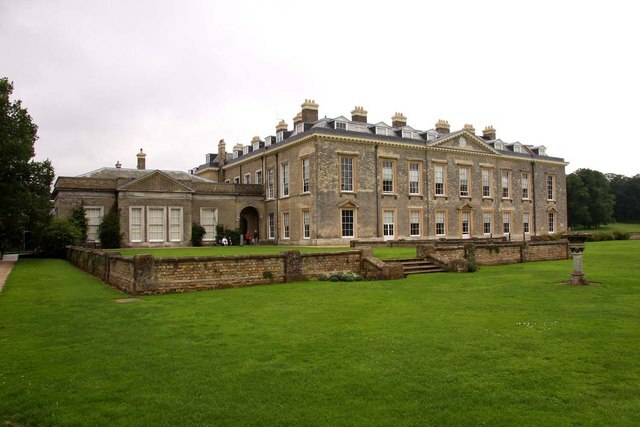 Prior to her wedding, she lived for a short period of time at the home of The Queen Mother, the Clarence House, before transferring to the Buckingham Palace. 34. Marrying Prince Charles meant her giving up her job as a kindergarten assistant. 35. 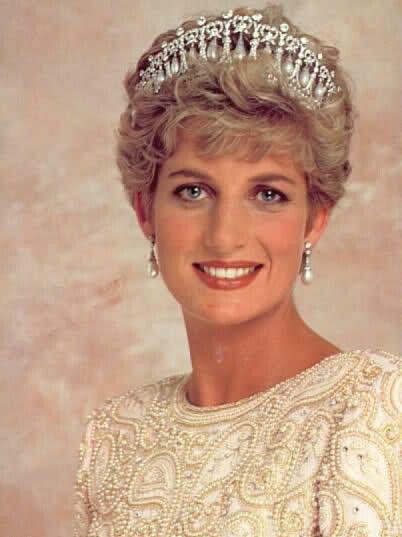 Diana’s engagement hairstyle was such a hit a lot of women also had their tresses done the exact same way as hers. 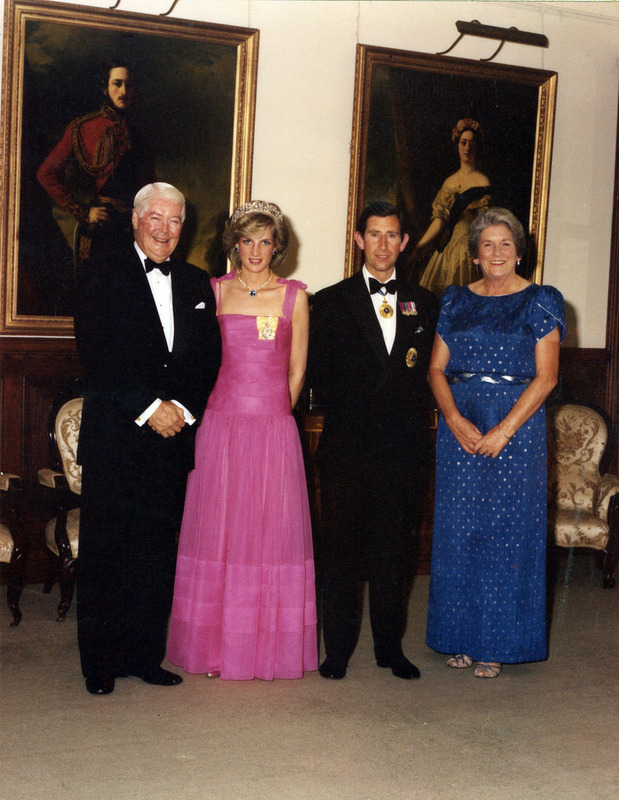 The Prince and Princess of Wales with Sir James Ramsay, Governor of Queensland, and Lady Ramsay, Brisbane, 1983. Image: Flickr/Queensland State Archives. 36. She surprised everyone when she chose fresh graduates and designer couple David and Elizabeth Emanuel to make her wedding gown. 37. Princess Diana’s wedding gown had a train that measured 25 feet or almost eight meters, the longest in all of Royal history. 38. The designers only had three months to finish the wedding gown, and at one point feared that they might not be able to beat the deadline. 39. 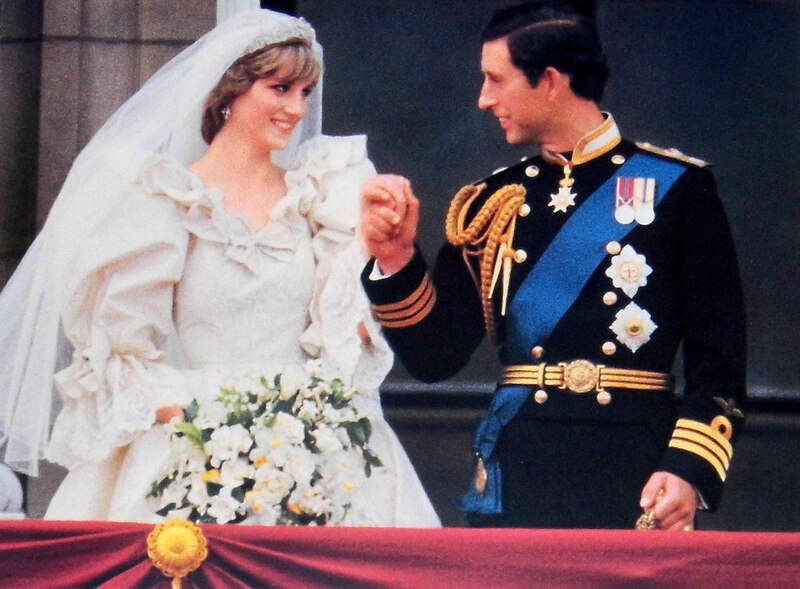 Princess Diana’s wedding gown was made of woven silk taffeta courtesy of Stephen Walters, splattered with antique Carrickmacross lace that was previously owned by Queen Mary herself. It was embellished with sequins, topnotch embroidery, as well as 10,000 pieces of pearls. 40. Lady Diana went from a size 14 to a size 10 prior to the special day after suffering from bulimia, which posed some difficulties during dress fittings that the designers had to create five different bodices until they settled for the last and final measure on the wedding day itself. Diana, Princess of Wales, chats with U.S. First Lady Hillary Clinton, 1997. Image: Wikimedia/ U.S. Federal Government. 41. Her enormous gown almost did not fit inside the carriage, something that the designers failed to realize during the number’s creation. As a result, the gown appeared crumpled when Diana stepped out of the glass coach. 42. Did you know that her veil was longer than her legendary train? It was a full 153 yards of tulle! 43. A stand-in dress was made in case the original design leaked to the public. It had no lace and had a more pronounced décolletage. The unfinished number suddenly disappeared from the studio later on. 44. 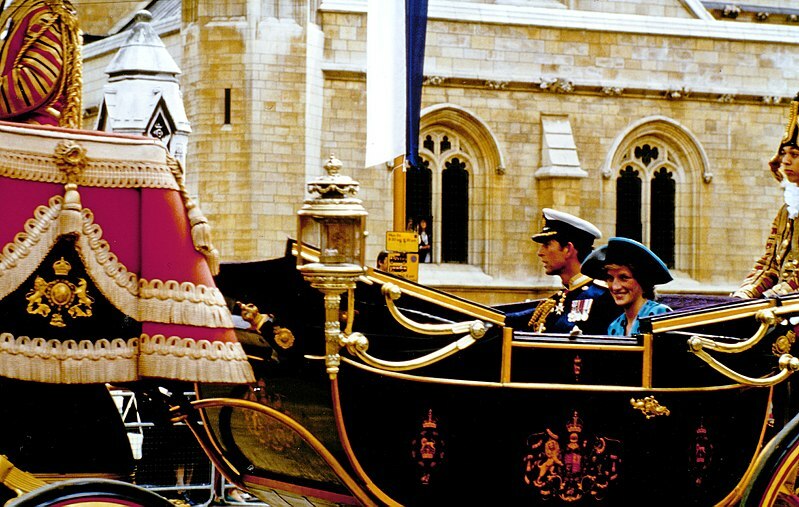 A matching umbrella was prepared, which Diana could use if it rained on her wedding day. It was made of two vintage silk parasols and ivory and white fabrics, and which featured stunning hand embroideries using the same antique lace, sequins, and pearls found on Diana’s gown. 45. She had a 23-inch waistline on her wedding day. 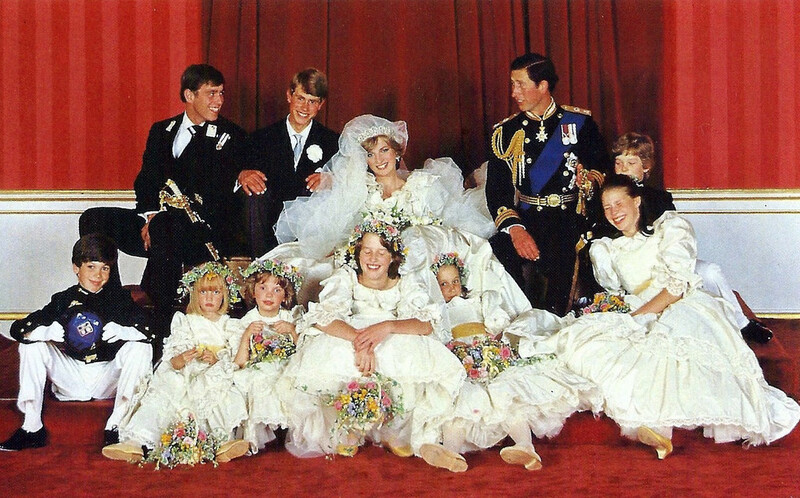 The newly-married Prince and Princess of Wales with their entourage. Image: Wikimedia. 46. Diana got her wedding dress a little messy while getting ready on her special day. She was spraying some Quelques Fleurs perfume when she spilled a tiny amount of it on her gown. She remedied the whole thing by tucking the front so to hide the small stain. 47. Princess Diana married Prince Charles with a safety pin hiding somewhere her colossal dress. The designers forgot to remove the said thing on the day of the wedding. 48. Her dress reportedly cost £9,000, which was more recently converted to £31,658. 49. Her wedding shoes took even longer to make! Six months were spent creating her silk shoes, which had low heels and which featured a heart-shaped design that used 132 pearls and 542 sequins. She was tall, so her slippers needed not to be too high! 50. She married Prince Charles at the St. Paul’s Cathedral on July 29, 1981. 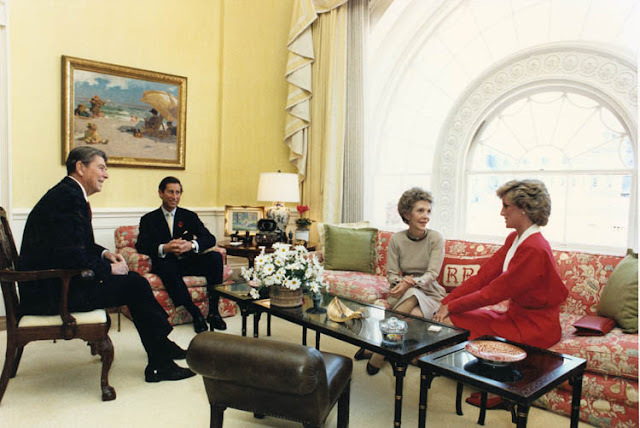 The Prince and Princess of Wales with U.S. President Ronald Reagan and First Lady Nancy Reagan. Image: Wikimedia/White House Photo Office/Reagan Library. 51. She was just 20 years old when she tied the knot with Prince Charles. 52. Diana is 12 years younger than Charles. 53. Diana arrived at the cathedral with her father John Spencer, 8th Earl Spencer. 54. Diana’s walk-down-the-aisle lasted for three and a half minutes. 55. The wedding stirred some controversies when Diana ditched the traditional vow and did not promise to “obey” Prince Charles. Postal souvenir sheet issued by New Zealand in 1985 on the event of Prince Harry's birth. Image: Flickr/Joe Haupt. 56. There were 600,000 people lining the streets on the wedding day, all hoping to catch even just the tiniest sight of Diana and Charles. Some 2,201 military men and 4,000 police officers were deployed to manage the crowd. 57. The wedding was watched by a staggering 750 million television viewers all over the globe, or one billion if radio audience will be added in! 58. Diana acquired the title Princess of Wales after marrying Prince Charles. 59. The marriage instantaneously catapulted Diana to the third rank in the United Kingdom Order of Precedence amongst females, trailing just behind the Queen and the Queen Mother. Overall, she was sixth in rank. 60. For their honeymoon, the Royal couple went on a cruise across the Mediterranean aboard Royal Yacht Britannia. It lasted for 14 days. The Prince and Princess of Wales during the wedding of the Duke and Duchess of York, 1986. Image: Wikimedia/Elke Wetzig. 61. The couple had a huge, heated fight when Diana took notice of Charles’s cufflinks that his previous girlfriend Camilla gave to him as a present. 63. Twelve weeks into her first pregnancy, Diana reportedly fell down a flight of stairs. She sustained severe bruises, however the fetus was fortunately uninjured. 64. Diana later admitted to intentionally throwing herself down the staircase as she felt “so inadequate” that time. 65. She gave birth to her first child, Prince William, on June 21, 1982. 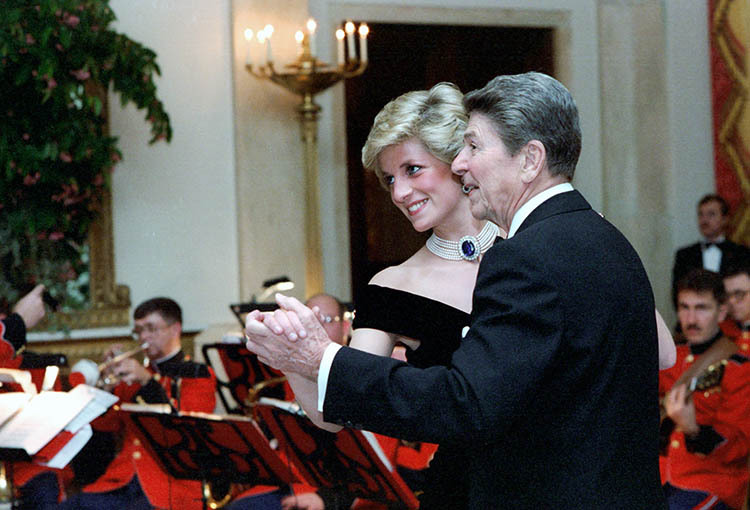 The Princess of Wales and U.S. President Ronald Reagan. Image: Wikimedia/Reagan Library. 66. Diana yet again broke another Royal tradition, which is giving birth at home, and had William in a hospital instead. 67. She faced media scrutiny after bringing with her baby Prince William on her tour of New Zealand and Australia. 68. She did not tell anyone, even Prince Charles, about the gender of her second child. 69. She had Prince Harry on September 15th, 1984. 70. It has been alleged that Prince Charles left Diana and baby Harry an hour after arriving at the Kensington Palace from the hospital just to play polo. The reason? He was upset that the baby had Ginger hair and that the infant looked more like the Spencers. Diana, Princess of Wales, meets with Sri Chinmoy in Kensington Palace only a few months before she died. Image: Wikimedia/Sri Chinmoy Centre. 71. Diana was the one who chose her boys’ first names. 72. She was a hands-on mom to William and Harry, and she would always call the shots when making decisions concerning her children. She would choose their clothes herself, and would personally bring the kids to school as often as she could. 74. As early as 1985, Diana and Charles were already facing marital woes. 75. It was in 1986 that Diana became completely aware of her then husband’s and Camilla’s rekindled romance. 76. Around that time, she started an affair with Cavalry officer James Hewitt, who also served as a riding instructor for William and Harry. For a long time, the man was rumored to be the father of Harry, however he later on denied the allegation in an interview. 77. She allegedly sent 64 love letters to Hewitt, who later threatened to sell the intimate stuff for millions. 78. Her affair with Hewitt lasted for five years after Diana broke off the relationship in 1991. 79. It has been alleged that her bodyguard Barry Mannakee was Diana’s first illicit lover. It did not take too long for the Palace to get wind of the affair, which resulted to Mannakee being removed from his duties in 1986. He later died in a motorcycle accident in 1987. 80. 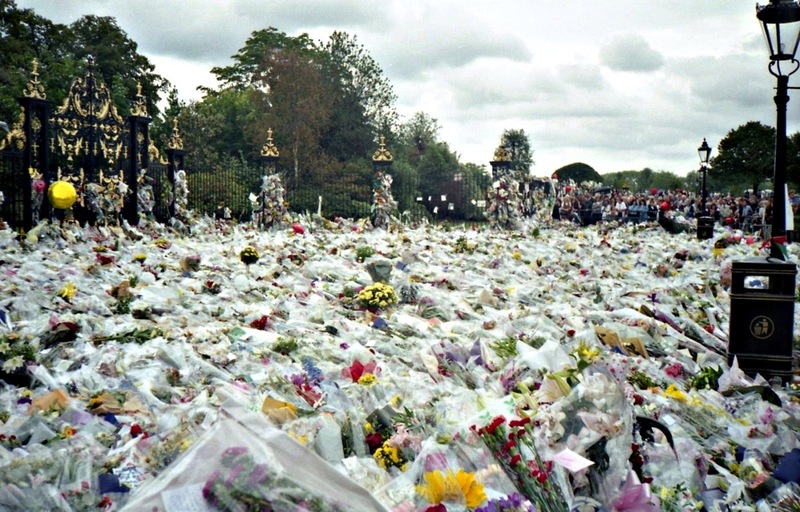 The news of Mannakee’s death was relayed to Diana by Prince Charles himself. 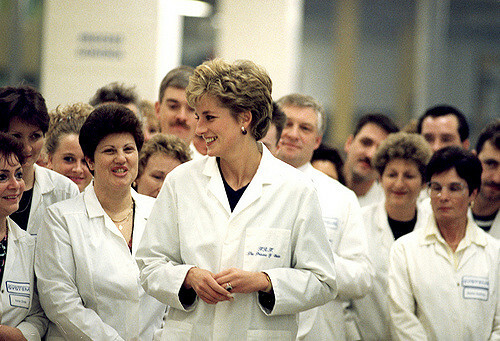 The Princess of Wales visiting Interconnection Systems (Plessey) in South Shields, 1992. Image: Newcastle Library. 81. The Queen and the Duke of Edinburgh once met with Diana and Charles in hopes of ironing out the couple’s differences, yet to no avail. 82. The extra-marital affairs of Charles and Diana were first officially confirmed in a book by Andrew Morton, Diana: Her True Story, which was published in May of 1992. The Princess of Wales had a secret interview with the author in 1991, Morton later admitted. 83. In the book, Diana also revealed that it was a remark from Prince Charles just a week after their engagement that started her bout with bulimia. “My husband put his hand on my waistline and said, ‘Oh, a bit chubby here aren’t we?’” she said. 84. Her intimate telephone conversation with another alleged lover, car salesman James Gilbey—which is infamously known as the “Squidgygate”—was exposed in August of 1992 by The Sun newspaper. Later that year, an audio as well as the full transcript of a private telephone chat between Charles and Camilla (known as the “Camillagate”) was also published by the same media outlet. 85. The Royal Palace officially announced Diana’s and Charles’s separation on December 9, 1992. 86. Diana sought the help of voice coach Peter Setellen between 1992 and 1993 to further hone her public speaking skills. The vocal training had Diana talking about private details of her life while being videotaped. She admitted to being “deeply in love with someone who worked in this environment," and considered him as the "the greatest friend [she's] ever had." The person she was referring to has been alleged to be Mannakee, though this was never confirmed. 87. In 1993, Princess Margaret burned deeply personal letters sent by Diana to the Queen for she thought they were “so private”. 88. Diana did a no-holds-barred interview with Martin Bashir for BBC’s Panorama on November 20, 1995. “There were three of us in this marriage, so it was a bit crowded,” said Diana when she was asked about Charles’s and Camilla’s affair. 89. Diana had a two-year relationship with Pakistani doctor Hasnat Khan, who she called “Mr. Wonderful”. The heart surgeon has been said to be Lady Diana’s greatest love that she even went to Lahore to meet the Khan’s family. 90. Diana and Charles were officially divorced on August 28, 1996. The Princess of Wales received a lump sum settlement that totaled to £17 million, plus she would be receiving £400,000 annually. Diana, Princess of Wales. Image: Wikimedia. 91. The title “Her Royal Highness” was removed from Diana’s name after the divorce, though the title “Princess of Wales” was retained. 92. 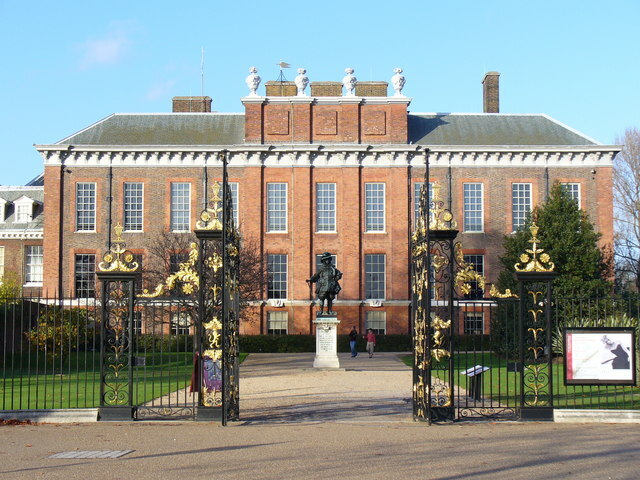 Even after the divorce, Diana continued to live at a double apartment in Kensington Palace that she once shared with Prince Charles. She stayed there until her untimely death. 94. She championed a number of important social causes. She raised awareness of leprosy as well as HIV/AIDS, and she supported the worldwide ban on landmines. She reached out to children and would pay regular visits to homeless centers in London. 95. She infamously shook hands with an AIDS patient in 1987 sans gloves. It happened at a time when almost nobody would dare do it, let alone a princess. She also hugged an HIV-positive child in 1991. 96. She had a short-lived romance with Egyptian business magnate Dodi Al-Fayed. The relationship started just a month after Diana and Hasnat broke up. 97. Diana’s and Dodi’s love story ended tragically. The two were involved in a fatal car crash during their romantic trip in Paris on August 31st, 1997. It has been said that the couple were trying to escape the paparazzi when the accident happened. 98. She was only 36 years old when she died. 99. Diana died the same week Mother Teresa succumbed to her own death. 100. Inside her coffin, the Princess of Wales was holding a rosary the Saint Teresa of Calcutta gave her. Chatsworth House is Worth Your Visit!